The Bullmastiff is a Working breed. That makes the statement “form follows function” of extreme importance. All dogs were developed for a purpose. No matter how attractive an animal is, if it cannot do what it was developed to do, it is a poor specimen of the breed. Bullmastiffs were developed to assist gamekeepers in England in ridding major landholdings of poachers and their hunting dogs. Poachers were certainly not all poor souls who trapped a rabbit to feed a starving family. There were organized gangs of poachers just as there were organized gangs of cattle rustlers in the American West. Deer, rabbit and game birds on the major estates were a profitable sale for these people, and they didn’t care if they had to harm the gamekeeper to get them. Originally called the Gamekeepers’ Night Dog, the Bullmastiff was developed to be a silent, agile, unstoppable deterrent to those who trespassed on the estates to steal game. Mastiffs were too large and cumbersome, the Bulldog of the day too ferocious. What was needed was a dog that combined substance, speed, agility and tractability. The early end product didn’t look quite like the Bullmastiff of today, but it did the job, and did it well. So now we come to the structure described in today’s Bullmastiff standard. The overall dog is just very slightly longer than it is tall at the withers. The back should be short. There should be a slight arch over the loin. The angulation front and rear should be moderate (and obviously should match). The head is a cube on cube (muzzle and skull). The chest is deep and broad, the bone is substantial but not cumbersome. This description put one in mind of the modern working Quarterhouse, and in fact, the Bullmastiff’s job requires it to do many of the same movements of the Quarterhorse: standing or moving quietly until action is needed, and then being able to sprint very quickly short distances, make quick turns and stops, and pick up speed rapidly while changing direction. The Bullmastiff has to have a good center of gravity in order to pin and hold a struggling grown man. It has to have the power to take out a large hunting dog rapidly and catch the poacher, all within a very short period of time. Today we are not really expecting most Bullmastiffs to be taking out hunting dogs on private estates, but they better be able to down and hold a burglar or someone attacking their owner. So let us examine how proper structure lends itself to the ability to do so. First, we look at the head. The large, square skull is fronted by a broad, square muzzle. The skull is a powerful battering ram, plus the well-developed cheeks add tremendous power to the grip of the jaws. The muzzle needs to be broad, with canine teeth set wide apart to enhance the power of the grip. The lower jaw needs to be wide, as there is no gripping strength in a narrow underjaw. The wrinkling on the brow should not be excessive. It should be easily noticed when the dog comes to alert because the wrinkling becomes much more pronounced. In the dark of night, putting a hand on the Bullmastiff’s forehead was a very easy way for a gamekeeper to tell if the dog was alerting on something. That is why the standard calls for a fair amount of wrinkle when alert. The eyes are only medium sized and are set under strong brows. This is protection against the brushy area the dog works in and protection against opponents, human or animal. The ears are moderate in size, and when the dog is alert the lower tip should be level with the eye. Large ears are a detriment to a dog in a confrontation. The neck is almost as large in circumference as the skull. This give strong support to the head. There is a slight arch to the neck, which acts as a shock absorber. The neck should flow smoothly into the shoulders. The shoulders should be moderately angulated. The standard only mentions rear angulation, but common sense dictates that the angulation front and rear should match. Very straight shoulders cause the dog to lack reach and to have a more pounding gait, which is not only tiring but ineffective. The slight layback of shoulder is also a shock absorber for the weight of the dog’s body against its legs striking the ground. Dogs of very light bone and body weight can function with heavy angulation, but a dog of substantial body mass needs its legs well under its body for support. Heavy angulation would place the rear assembly well behind the body and severely lack support of the dog’s weight. Support of the dog’s substantial form is enhanced by the short back and legs set squarely under the four corners of the body. A soft back is a serious weakness in a dog that needs front to rear coordination for rapid starts and stops and directional changes. Likewise, a roached back interferes with the proper flow of coordination from front to rear. Long backs may make it easier for a dog to effect a long, striding trot, but one has to remember the Bullmastiff did not use that gait in its work. It walked with the gamekeeper until a trespasser was detected. Then the dog was set loose. It would not have trotted to its target, but would have run at it, surprise and speed being two of the dog’s powerful assets. Anyone struck by a Bullmastiff running at speed isn’t getting up and going anywhere. While the flank should have a tuck-up, it should not be pronounced. Lack of tuck-up in the flank interferes with the free movement of the rear legs. A moderate tuck-up continues the look of substance and strength in the body without weakening or impeding the dog’s power. There should be a slight arch over the loin. 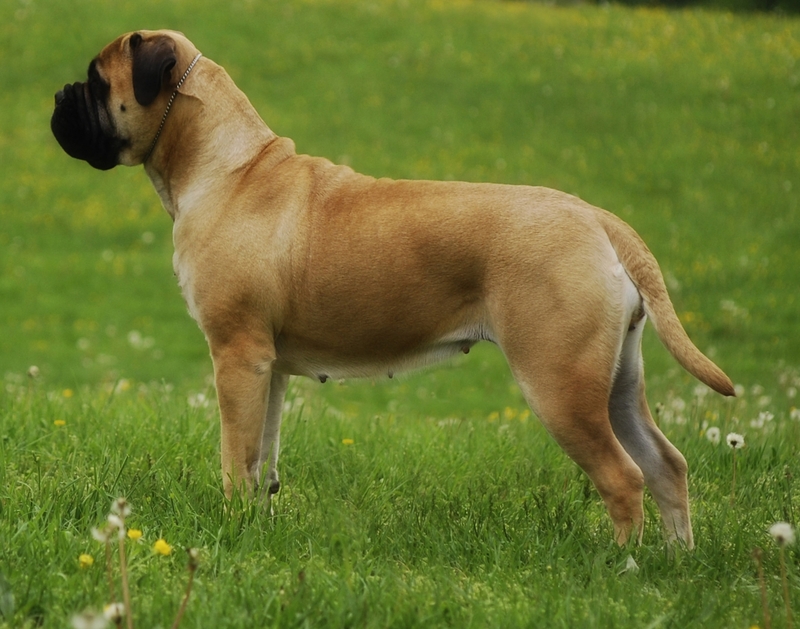 As the Bullmastiff does not have strong angulation, the slight arch indicates a slight tip of the pelvis, which assists in the proper function of rear drive. The arch is only slight and only over the loin. There should be no arch in the back. The Bullmastiff should have a powerful, well-developed second thigh. Lack of substance in the thigh muscle is neither pretty nor functional. Long, stringy thigh muscles may work for a dog whose proper working gait is a long sustained trot, but for dogs that have to make quick starts and stops and directional changes, a strong second thigh is necessary. The standard calls for the tail to be set on high. A low-set tail is obviously the result of too steep a croup. While the tail is to be set on high, it is not to be carried hound fashion over the back. It can be carried well above the body’s top line. One of the signals a Bullmastiff who spotted something gave a gamekeeper was that his tail would rise noticeably. There is nothing wrong with carrying the tail above the body line. In fact, it is a sign the dog in interested in what is going on around it. I’ve never seen a dog who cared about what he was doing at the moment go around with a limp, dragging tail. The only way tail carriage is faulted in the Bullmastiff is if it is carried hound fashion. In order to support a substantial body with well-sprung ribs and good width front to rear, the legs have to be substantially boned. Not only is it not pretty to see a substantial dog with skinny legs, it is a threat to the dog being able to do its job properly. The weight of the body can easily break down the supporting leg tendons and feet. Feet are a highly important factor in a working dog’s function. Bullmastiffs worked over basically rough terrain. They needed thick, heavy foot pads and tight feet. Splay feet are listed as a serious fault, and well they should be. Opening the membranes between the toes to the rough ground because of splayed toes and lack of cushioning from weak flat pads and toes will cripple a dog in a very short time. The Bullmastiff needs a tractable but alert temperament. It has to have a real interest in what is going on around it. Being quiet doesn’t mean a dog is disinterested, and being hyper doesn’t mean a dog is capable of focusing on its job. The dog should always give the appearance of power but use it only when needed. 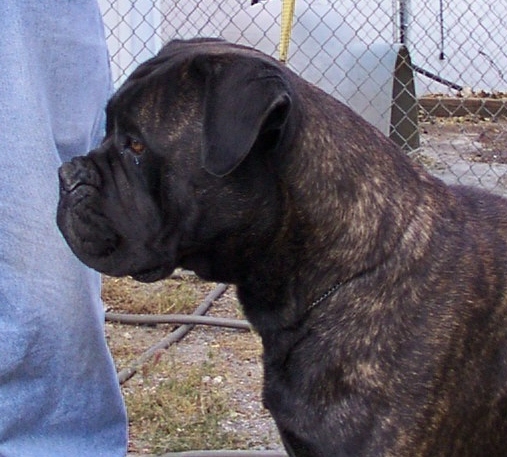 A long, weedy Bullmastiff or a dumpy bulldoggy Bullmastiff does not have the form to fulfill the function for which the breed was developed. Fat is not substance. A good working dog should have well-defined muscle and be fit. If a dog can’t get around a ring without gasping for air it certainly couldn’t run full out at a poacher, take out the poacher’s dog and pin the poacher to submission. Working dogs need to be just that in fitness and form as well as in AKC category. So now we have a picture of the Bullmastiff as a dog that worked either at a walk or full-tilt run. It needed to be alert but under control. It needed a strong center of gravity but enough leg under it to be agile. It needed a strong head and jaw, good substance but never cumbersome weight or build. It needed substantial legs and thick, tightly padded feet. In other words, the Bullmastiff is a tight, well-muscled, substantial dog, with excellent balance of body parts and the agility to do the job of a Night Dog, whether or not he lives on a vast estate or in a small home. He is still a guard dog, a working dog, and even if his primary occupation these days is in a show ring or as a family companion, he should never lose the ability to do what the standard of the breed calls for. As long as form is based on the function for which the dog was intended and breeders adhere to that form, the Bullmastiff will retain the function it was designed for. In the breed for a half-century, Carol Beans of Tauralan Bullmastiffs is head of the American Bullmastiff Association’s Judges Education Committee and has served on the parent-club board for 13 years. 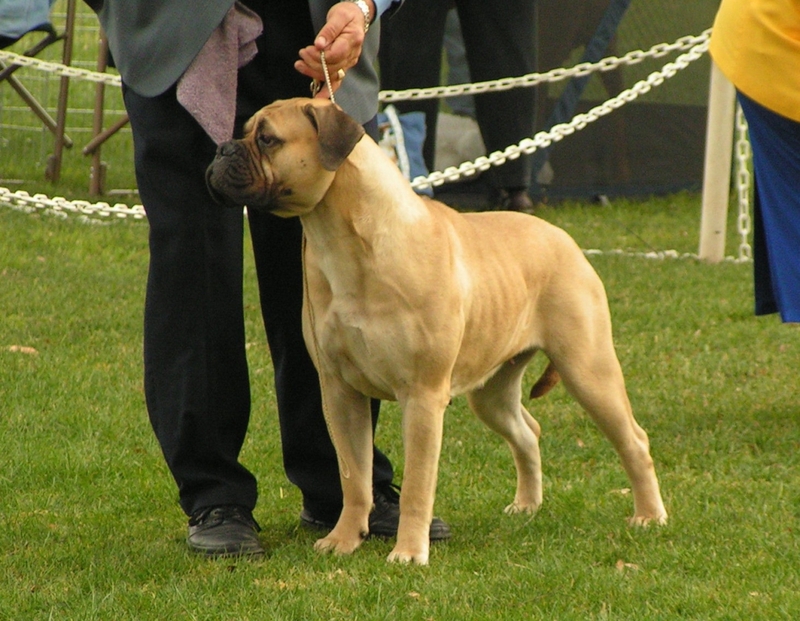 She has judged the breed at championship level in England and Canada, judged the ABA natioal specialty, and had the top Bullmastiff (all systems) in 2001, 2003, 2006 and 2007. The mother of three and grandmother of seven, she lives in Santa Ana, California.